Consul General Dr. Sun Dali met with Councilor Peter Connor, the Ceremonial Mayor of Salford at his residence on November 1st, 2017 in the company of Deputy Consul General Mr. Fan Yingjie, Education Counselor Mr. Wang Ying and Consul Lyu Xiaomei. 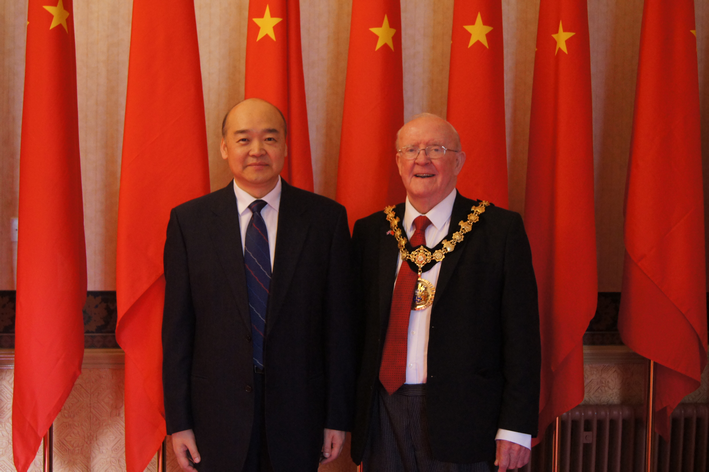 Dr. Sun briefed Councilor Connor on the responsibilities of the Consulate General and called upon Salford to seize at the opportunities presented by the ‘Golden Era’ of China-UK relations and take an active part in China-UK communication and cooperation to achieve common prosperity. Councilor Connor thanked Dr. Sun for inviting him to attend many meaning events, from which he understood more of China. Salford is always open to Chinese investors and looks forward to more cultural and business cooperation.